Really?? It’s Friday?? This week seemed to go by way too fast. I was hoping to do a web quest challenge week again this week but ended up not having time because of other projects. What I decided was to write two quests now and get feedback on them. What I eventually want to do is to have a new “assessment quest” for each strand and for each grade level in the Quaver curriculum. Sort of an alternative or project based assessment to test the students know how after each unit. Each quest will come with a short rubric. The rubrics are rough draft so please help me with revisions so I can come up with a simple rubric that is easy to use and can be altered for each quest. What I want from you is that if you use one of these quests PLEASE let me know how it goes and give feedback in the comment section under neath this post. If I am to take on an idea this big I’d like to do it right and do it well! 2.) Songbrush- Take that listening map you did in step one and transfer it to the Songbrush app in the Shop. Listen to it after you are done and write two sentences on that scrap paper describing how it sounds compared to what you thought. 3.) QGrooves- Pick a partner and each of you write a QGrooves piece with a specific form (AB, ABA, ABACA), take turns trying to guess what form each of you has created. Excellent- The student can compare listening maps and identify form with no assistance from the teacher. Proficient- The student can compare listening maps and identify form with little assistance from the teacher. Fair- The student can compare listening maps and identify form with a lot of assistance from the teacher. Novice- The student cannot compare listening maps and identify form even with much assistance from the teacher. 1.) Songbrush- Go to the Shop and create a melody painting where the notes go up and down in the picture. 2.) QSplat- Head to the Arcade in your Music Room and click on QSplat, you need to know the right length of the notes for this game. Practice figuring out how many beats each note has. 3.) QComposer- Now we have to create your melody. Travel to QComposer in the QStudio, you will create 3 measures of melody using only half notes and quarter notes. Make sure the notes go up and down and there are only 4 beats per measure! Excellent- The student can compose a piece using correct note duration and a varied melody contour with no assistance from the teacher. Proficient- The student can compose a piece using correct note duration and a varied melody contour with little assistance from the teacher. Fair- The student can compose a piece using correct note duration and a varied melody contour with a lot of assistance from the teacher. Novice- The student cannot compose a piece using correct note duration and a varied melody contour even with much assistance from the teacher. 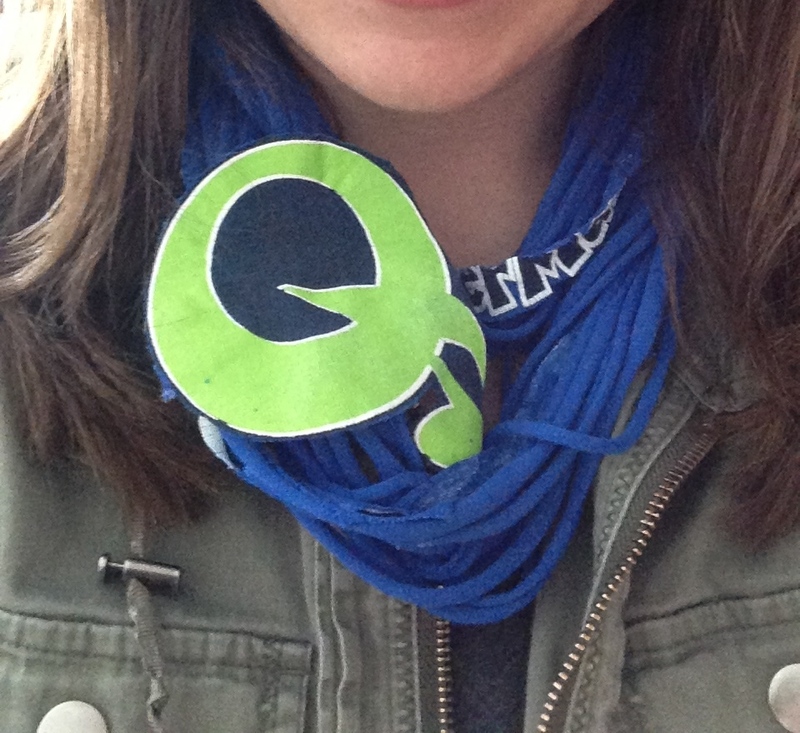 Have a Wonderful Quaver Adventure! PLEASE let me know what you think! Just running by with a quick post this week! I’m all over the place this week and to top it all off I have been fighting yet ANOTHER cold which has made me slow down quite a bit! Chugging Emergen-C and eating ColdEeze like it is my job! Yes I know, I really need to be in a bubble or something. Last night I pulled off a drive through presentation (ran in last minute just started talking during my slot, and then really just ran out. It was fun!) I talked about using the SAMR method for integrating iPads into the classroom at our district iPad conference.I then went on to show some really cool apps and then gave a few resources to keep collaborating and learning which included a big Pinterest board I put together. It was my first really non music tech presentation I’ve done in a while, go EdTechies! Below is my handout and my power point with all the links and information from my session. It’s been quite a busy and stressful week, we recently had a change in administration which brought on some chaos this week with the kids not exactly knowing the authority figure in the school. Luckily things began to calm down as the week progressed and I have high hopes with a new consistent authority figure in the school beginning next week we’ll be back to normal! I’ve been getting a horrible case of cabin fever though. If you know me I LOVE to travel and I think with all the snow and the monotony of the school day I’ve got ants in my pants and I’m ready to GO SOMEWHERE..I know it’s only been three weeks since TMEA but..I’m ready for another adventure! This month is Music in Our Schools Month. I have been planning occasional special things from week to week and one thing I like to do is bring in current or recent hits and play them to have a quick discussion at the beginning of the class. It is a great listening activity, gets the students roped into the lesson, and promotes listening to music outside of the classroom in a different way. This week I did a quick discussion of a song cover. We discussed how one can have an original song and then another artist can take that song that is already recorded and shared and make it their own and record it to share. We talked about how not all the songs on the radio are written by the singer they hear singing it some of them are covers where the singer they know redid someone else’s song. The great part about Youtube is that you can find song covers from many people. We focused on the song “Let it Go” from the movie Frozen. We talked about the differences and I tried to get the point across that it might have Demi’s name on it, but Queen Elsa sung it first! Demi is covering it. With the Alex Boye one we had a discussion on how covering a song can leave you open to really be creative with a song you already know and do your own thing. With the video from Jimmy Fallon we talked about how even though it is Queen Elsa singing it, it is still a different song because of the instruments being played in the background, in order to cover a song it needs to be different from the original…and then I promised them I would try to get them together to play the Jimmy Fallon version next week! Every single class asked if we could do this again next week with a different song. A couple other cool covers you can do this discussion with? Mario Theme song, Play the original and then search for it on Youtube played by an orchestra there are a few great arrangements out there. What are you doing for MIOSM? How are you going to make it special for your students? This week I’ve had the privilege to guest speak at a college class up at my Alma mater Plymouth State University. I had the same opportunity last year but only went up to speak for a day, this year I had two class periods to share my knowledge and resources on music technology in the elementary music classroom. Day 1 consisted of blowing their minds with as many resources as possible (I think I saw some smoke) but Day 2 I really wanted them to get their hands on a lot of what I was talking about. So after a quick sharing session on some websites they had already tried out, we did a tech sandbox. Hands on time with a product, you get to see and feel it for yourself, therefore learning more about it then just hearing about it from another source. Experimentation; your mind works differently than the person next to you. Use Sandbox time to bounce ideas off others in the room, see how many things you can figure out about the piece of technology before recess time ends. No fear of failing. Don’t you hate that feeling of getting so pumped to try something new in your classroom only to see it fail? Use Sandbox time to try out those new ideas before it hits your classroom. With others around you, you can experiment and get feedback to create the perfect activities with your new tools. 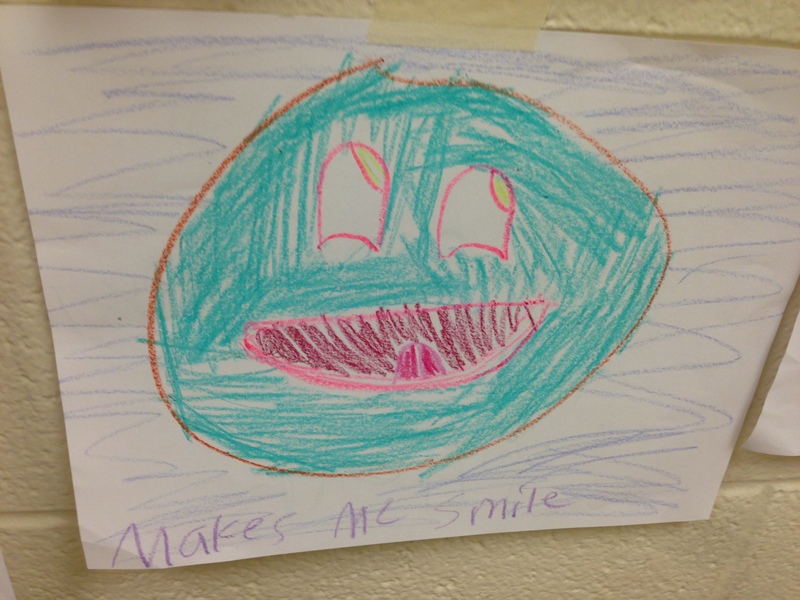 It is also a great way to have fun while you learn! 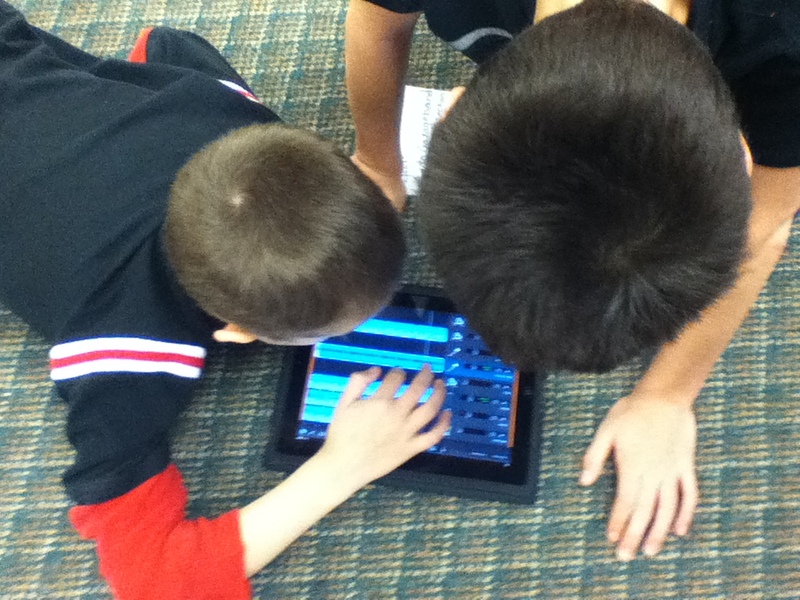 It was really cool to see the students in the classroom have such a great time playing with the tech I brought. The Makey Makey was probably the star of the show! 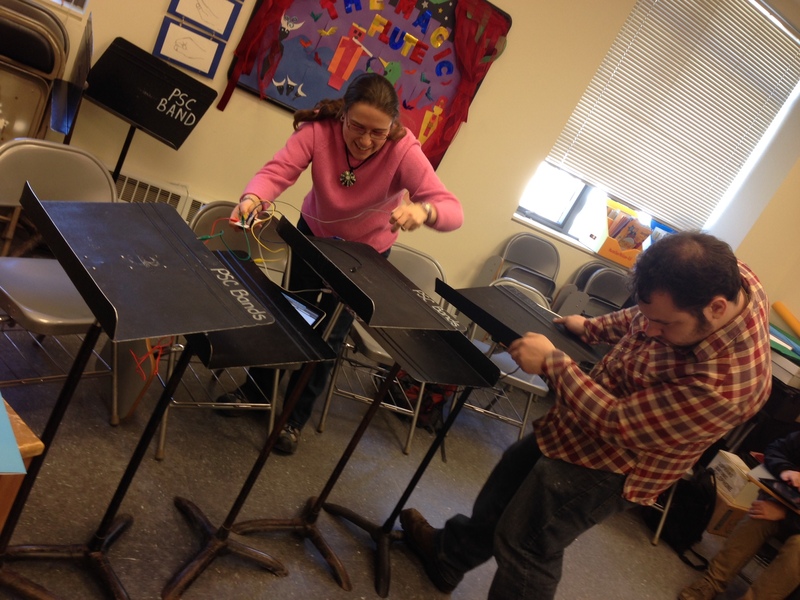 PSU Students making a music stand piano!